Since I was a kid, dinosaurs have always been something I enjoyed. Whether it’s an old BBC documentary, or a good round of Turok, if it has prehistoric beasts in it, I’m game. 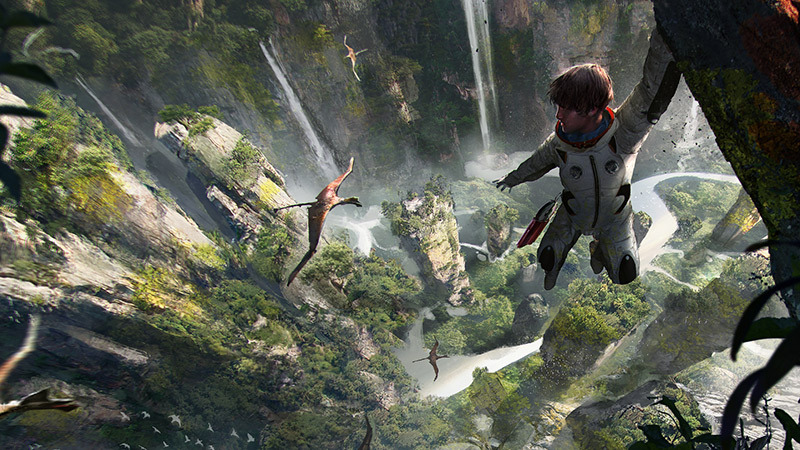 That’s why I was so incredibly excited when Robinson: The Journey was announced for PlayStation VR. It’s a game where you explore a planet inhabited by none other than dinosaurs themselves! What could possibly go wrong? Now that I’ve actually played Robinson: The Journey, I found a lot to love about the game. The promise of towering giants and sweeping vistas was most certainly kept, but there are a few things that hold back the game from true greatness. So now comes the question: is Robinson: The Journey a must-play adventure, or should this game go extinct? It’s time to answer that question! Robinson: The Journey is a science fiction homage to the classic tale Robinson Crusoe, and the parallels are evident in the game’s setup. You play as a young boy named Robin who is the sole living survivor of a spaceship crash on the planet of Tyson III. After a quick introduction, and a meet-and-greet with your baby tyrannosaur pet named Laika you’re placed in the shoes of this person after they’ve spent an extended amount of time on the planet. The game opens with you standing in the makeshift home he has made for himself inside of a crashed escape pod. There are items strewn across the tables beside you and a floating orb A.I greets you as you get your bearings. He is named HIGS, and beyond your pet dinosaur, he’s the only other thing resembling a person that you have to talk to. When you walk outside, it’s truly impressive to see how Robin has managed to set up power, start a farm, and really make a life for himself on this planet. He still doesn’t know exactly what happened, or if there are any survivors left from the crash. That’s the driving mystery of Robinson: The Journey. As you begin to explore the alien planet you’ve found yourself on, you’ll come across bits of story and audio logs that help you understand what happened and propel you to some sort of solid answers. Robin comes across a broken HIGS unit that gives him some small answers, and this sets you off on a journey to find the rest of the missing information. It’s a simple, but solid story that gives you the hunger of curiosity without starving you of information. It also moves at your own pace, giving the game a slightly open-world feel. This tone lends itself well as the lack of urgency makes you feel good about taking your time and exploring the environments you find yourself in. By the time you finish the adventure, you’ll feel like there’s more to say about this world and Robin’s story, but despite the lack of a world-spanning journey, Robinson still manages to tell a nice self-contained story that I would love to see expanded upon. I just wish there was more of it, as Crytek’s incredible penchant for level and environment design begs a deeper story than what we’ve got here. The gameplay is Robinson: The Journey takes a risky gamble in the realm of VR. I should start by saying that I myself have rarely gotten motion sickness from using the VR headset. For the purposes of the review, I had my girlfriend Christina play the game as well. In my experience, sickness wasn’t a problem. The game’s default setting has you walk with the left analog stick and look with the right. In the standard settings, the right stick has you turn the camera in short bursts to avoid motion sickness. You can change this to be smoother, or completely smooth out the turning if you prefer. Again, I’ve never had issues with VR motion sickness, and as a result of this I didn’t experience any problems. However, Christina was playing on the default settings and she couldn’t make it out of the first area before she started to feel queasy. I think this aspect of VR makes it difficult to objectively review games, because a lot of it is based on your personal stomach tolerance. If you’re prone to sickness with VR, Robinson may test your boundaries, but for me it wasn’t an issue. Moving on, the game itself involves interacting with puzzles and creatures as you explore. Your tool that you have looks a lot like a Move controller. The game is not Move compatible as of this writing, but there have been talks from the developer about adding it via a patch at some point. Not being able to use the Move controller is both a blessing and a curse. On the one hand, I don’t have to fumble around my living room trying to find the controller with a VR headset on, but on the other hand it’s a little immersion-breaking when I feel like I should be able to reach out and interact with the game’s environment, but can’t. That leaves much of the game’s interaction to your controller and the head tracking (which I’ve found to be extremely precise). In Robinson: The Journey, you can interact with objects, pick them up and throw them, and even scan the wildlife around you to add to your encyclopedia. You’ll also solve simple puzzles that allow you to transfer your view to HIGS and get an incredible diorama view of the environment your inhabiting. Here you’ll solve power puzzles while enjoying the view. In terms of the gameplay, I thought Robinson performed really well for the most part. I did miss the lack of motion controls, but the standard ones worked fine. The times when I most missed the motion happened when I was doing the climbing sections. In these moments, you moved your hands with your head and used the triggers to climb. I had moments where I had to lean or stand up to get my virtual hands where I wanted them, which was a little annoying, but eventually I made it work. This was probably the worst situation I encountered when it came to the controls. The other situation I had was the scanning. When you want to add a creature or dinosaur to your digital dictionary, you have to use your head tracking to scan them and only select the green dots on their body with your cursor. There are red dots that will force you to reset. This is an interesting mechanic, but man, it was difficult trying to scan a gigantic dinosaur without hitting any red dots. During some of the puzzles, I found myself getting frustrated with moving and placing objects as well, but for the vast majority of the time, I was really enjoying the landscapes and the dinosaurs I encountered. Yes, some of the controls frustrated me, but ultimately I had fun exploring this world. When it comes to virtual reality on PlayStation 4, graphics aren’t going to be incredible with the limitations of the system, but Robinson: The Journey does a good job of providing immersive graphics. While I haven’t had the opportunity to play the game on PS4 Pro yet, I have heard that there’s an improvement in the detail and clarity. The current PS4 displays nice graphics, but there’s definitely some blurry textures in the headset while you’re playing. The dinosaurs look nice, and they have a lot of scale to them in VR, but the environments can be hit or miss with the clarity. I imagine PS4 Pro may clean this up a bit. Overall, Robinson: The Journey is one of the better looking VR games out so far, but it does showcase some of the limitations of the current PS4. Depending on where you are, the cost of this game may vary, but overall I really enjoyed the world that Crytek built. It may cause some sickness or frustration, but you can’t deny that this is a very full and complete VR game. 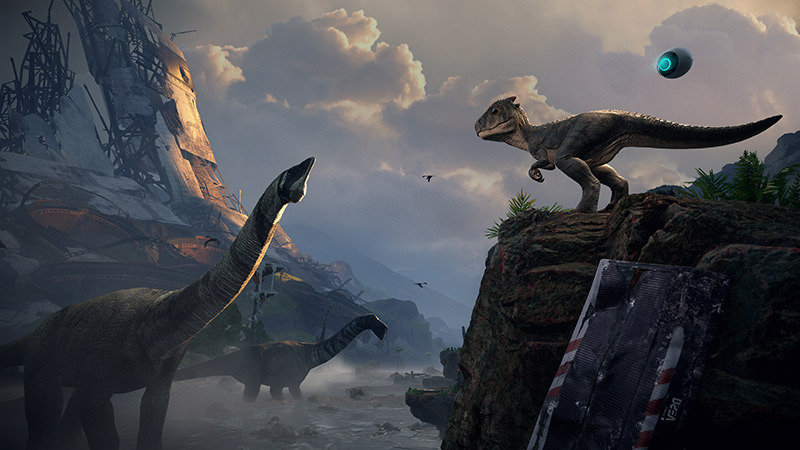 At the end of the day, if you’re a fan of dinosaurs and you have a PlayStation VR, it’s a really cool title with some impressive graphics that will most likely look even better on PS4 Pro. This game looks pretty amazing. I love the music score as well. Anyone else try it yet? Worth the buy?